Look no further, American Control & Engineering Service, also known as ACES, can provide all your control needs. From new design and engineering to repairs and upgrades to existing equipment, our skilled and experienced engineers and technicians have you covered. ACES is one of the few companies in the Wichita area qualified to analyze, troubleshoot, build and commission today’s complex control systems. National aerospace customers such as Boeing and Spirit Aerosystems trust us to develop their PLC and HMI solutions, and calibrate, repair and maintain their pyrometric systems to the highest national safety standards. ACES is gearing up for on-site production of steam generators for enhanced oil recovery. We will build according to your steam requirements up to 85 MMBTU. Our highly developed FlexSteam Control System will ensure that your existing generator or new purchase will perform to strict specifications day in, day out, year after year. Our products and software are backed by fully qualified in-house generator maintenance technicians. If your generator is not currently operating at peak efficiency, we have the tools and expertise to get it there. We can design and build an oven or furnace to meet your requirements for size, temperature, and configuration including drop bottom ovens. With ACES, you can be sure that you are getting the most comprehensive integration solution: we produce the oven and provide a complete software package. Our custom FlexFurnace software is included which provides database logging and reporting features that enable you to incorporate the oven into your corporate data system. When the project is complete, our metrology service technicians can maintain certification and accuracy for your new oven or furnace. Trust our metrology capability to keep your equipment and machines running smoothly today. Rely on our commitment to be on the cutting edge of developments in design and product to lead you into the future. 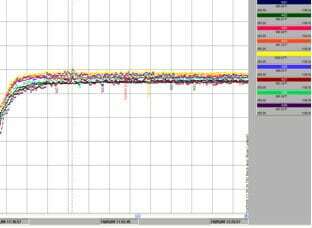 Chessel output shows temperatures stabilizing after oven door has been opened.